Big Data is a term used to describe large and complex data sets which reveal certain patterns that can help with decision-making. It’s a compelling concept: want to understand patient behaviour; predict the next big global disease; or see which geographical location has the highest cancer diagnosis rate? Big data can do that. Big Data does have its limitations as it is only useful to a person if they can do something with it. In the case of medical professionals who are looking to either improve the business side of their practice or to provide a better patient experience; it may be better to have data that relates directly to their practice. That’s why the answer to discovering useful patterns at practice level is often ‘Small Data’ – the data that is derived from your own medical practice. Small Data consists of usable chunks of information – often presented visually – that can provide meaningful insights and help you with everyday tasks. This data can be derived from your financial reports, clinical information and even practice processes. Tracking practice process data can often be quite manual if you don’t have the right technology to consolidate and analyse the data for you. That is why this aspect of a practice is often ignored or neglected. However, these data trends are essential to ensure practices optimise all key aspects of their practice. Below is an example of how Small Data can work for your practice. 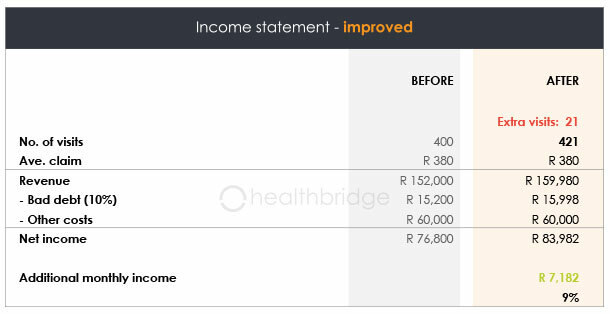 So, by adding just one more patient visit per day (although on some days of the week, many more patients could be added), the practice could be earning an additional R7 182 per month, or R86 184 per year. It’s called load balancing – in other words, you schedule (where possible) less critical or repeat patients on quieter days. They will be happier with the quieter waiting room, and you will have more capacity on your busier days. What on the surface might appear to be just a lot of meaningless numbers can, on further analysis, turn out to be a rich source of information that can improve both your business and your patient experience.